The H7N9 virus appears to have been brought under control in China largely due to restrictions at bird markets, but caused some $6.5 billion in losses to the economy, U.N. experts said on Tuesday. Health authorities worldwide must be on the lookout to detect the virus, the experts said, which could still develop the ability to spread easily among humans and cause a deadly influenza pandemic. The new bird flu virus is known to have infected 130 people in mainland China since emerging in March, including 36 who died, but no cases have been detected since early May, Health Minister Li Bin told a meeting of the World Health Organization. One case was found in Taiwan in April, making a total of 131. "The immediate outbreak has been controlled, but it is also unlikely that virus has simply disappeared. We believe we need go another autumn/winter/spring season to know," said Keiji Fukuda, WHO assistant director-general for health security. "We also have high concern over the potential, I stress the potential, to gain the ability to sustain transmissibility." 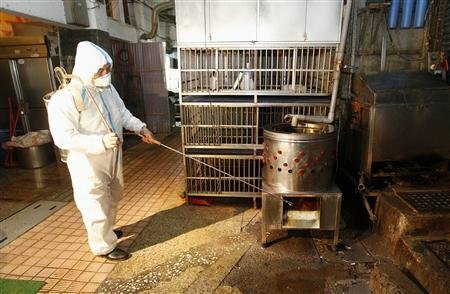 There was no evidence of sustained spread among people and "most cases probably resulted from infected poultry or perhaps contamination related to live poultry markets," Fukuda said. Li said local Chinese authorities had shut down live poultry markets "temporarily or permanently as needed" to control the source of outbreaks in 10 provinces. It standardized methods of transporting poultry to reduce spread among birds. China's government had spent 600 million RMB or $97 million to support healthy development of the poultry industry, Li said. "In view of the present situation, H7N9 is preventable and controllable. There has been no qualitative change in the epidemic. Cases are sporadic and there has been no genetic mutation (of the virus)," she said. H7N9 is highly pathogenic in humans, causing severe respiratory disease, but is not virulent among birds, making it nearly impossible for farmers to detect, experts said. "There have been no (human) cases since May 8, that is a good indication and means measures are being taken seriously. Now when the virus is found at market, all birds are killed, that is important too," Bernard Vallat, head of the World Organisation for Animal Health (OIE), told reporters. Out of 60,000 samples taken from birds, 53 were found to carry the virus, Liang Wannian of China's health ministry said. There is "no red flag" for H7N9 among poultry, unlike H1N1 which kills off flocks, said Juan Lubroth, chief veterinary officer at the U.N.'s Food and Agriculture Organization (FAO). "Economic impacts of H7N9 have been astounding," he said. "Over $6.5 billion has been lost in the agriculture sector because of prices, consumer confidence and trade. So poultry industry losses in China have been high," Lubroth said, later making clear it was an estimate by China's agriculture ministry.